is it possible to measure the (real) power usage of any device with a DSO? I ask because I must do something wrong here. I try to find out how much power a PSU unit "eats". I used a tRMS multimeter to compare the current clamp value and it's about the same. So I tried something else. I have a 3-phase power meter (UMG 503) installed in my house connection box (or whatever it's called). I can monitor several values via serial connection, so I opened the rms current display and the current jumped up 1 A after I switched on my "PSU" with connected load. The 1 A measured by the power meter device are way closer to the estimated current/wattage. Is there a way to display the real/true wattage on my DSO? you might also want to check out a shorter video posted by some of the Tektronix factory guys, talking about the basics of using basic digital oscilloscope. Ha! They didn't see your 1x,10x probe video! Right? It looks to me like they have not adjusted the compensation on their probe. The capacitor was adjusted a little too big. Yeah, I spoke to them about that! Probably a lot easier to hear it from you then a novice like me. I've watched 3 of your videos, they are dense for me (as-in filled with info). The scopes for dopes was interesting but I will have to watch some parts again. The 1x10x was useful and I can apply that. The component tester will also be easily applicable someday soon. Do you have any video recommendations out of your playlist for a novice? I've picked up a lot just watching Dave's videos on various topics where he uses a scope. I've also watched various videos on scopes, some that were a waste of time and some that offered practical and interesting bits. Like the fact that the ground (or reference) probe is actually an earth ground. Easy for a novice to get lulled into safety coming from using a handheld multimeter. It really depends on what you feel you need to learn. I've got about 130 videos on the channel now - ranging from entry level topics to some more advanced. 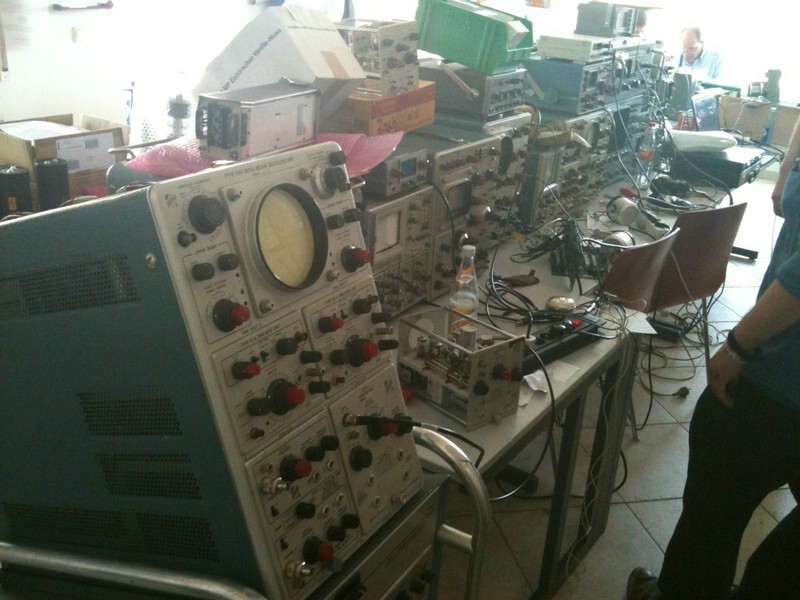 There are topics on various subject concerning oscilloscopes and their usage. I'd recommend watching those on AC/DC coupling controls, triggering controls, vertical controls and basic measurements. There are also videos on spectrum analyzer topics, and other test gear. I also have videos on several op amp and transistor basics and circuit designs. It all depends on where your interests lie. It will only take you 5-10 minutes to skim the titles of all 130 videos, and make note of those that interest you. And of course, if there's a topic that you'd like to see - let me know! I will check the list, I have browsed it quickly. I will look for "You just got your first scope, set it up like so before turning it on." Then something like "here are some things to check right away to determine if it's working properly". So if those are there I'm in luck, if not consider them suggestions. Thanks again. Perfect founmental knowledges on oscilloscope. I am new in this forum. I love to play with electricity. So i hope i will learn exciting thing about electricity here. This video is a recording of a 90 minute my presentation entitled "Basics of Oscilloscopes, and their use in the hamshack". This was presented at one of the clubs I belong to - the Ocean Monmouth Amateur Radio Club, in Wall Township, NJ. The presentation was recorded on 12 July 2014. Audio quality isn't the best, so apologies for that up front. I watched this one very interesting video, I wondered if you put it on hear, I Learned something straight off the AC/DC, I was convinced you had to use AC ,for ac, and DC for dc, I really did think, it was a simple as that, I like to learn something NEW everyday and I did. for you Alan. If it's highly recommended, then I'm not interested. You're welcome! Be sure to let me know if there's a topics you'd like to see in a future video. So excited to watch this! I'm in basic electronic classes and I don't think we covered enough on how to use 'scopes. I keep having to get help when using one and its getting kinda embarrassing. In addition to the 2hr class at the beginning of this thread, I also posted a recording of another class I taught more recently. This second on is a little shorter. when you come to germany I will invide you to make a video "how to work with a classic Tek"
Hi there all, i have watched your oscilloscope tutorials and really enjoyed them, the biggest problem i have is working out the frequency, at the moment im experimenting with transmitters and receivers, purely for fun and to learn, yet, when i try to measure the signal i always seem to get 50Hz, i have watched alot of online videos, read books, but im interested in learning how to learn how to use it fully, i have only recently got myself an oscilloscope, but i have used on before at college. Getting 50/60Hz on the scope is almost always caused by having an insufficient ground connection between the circuit and scope probe. Either it is too long, or non-existent - thus picking up the mains out of the air. First of all thank you for posting the scope educational video and also all the work you've provided to us on YouTube. Very good and I've been through many of them. My question has tondo with Tektronix analog scope longevity. I see you using the Tek 465 and 2465 and these scopes are from the mid 80's or maybe earlier. I guess maybe you're an expert in keeping these scopes within spec. What about for us us more average yet enthusiastic hobbyists? How long might these scopes faithfuly serve us before they reach the end of a useful life? Do the CRTs eventually go bad and required replacement? Are there unavoidable faults that the expert takes in stride but will sink the novice? Since most of us might only have a good DVM and maybe an entry level DSO, could we reasonably keep these older Tek analogs running within acceptable limits. They really are cool, and prices for ' refurbished and calibrated' coming in around $300 US, they look interesting. Could you give a broad overview as to what to expect and the best ways to enjoy these scopes? Or, do they just keep running forever and can sit for a year and start up accurate and on cue? In general, these older Tektronix analog scopes hold up very well. My 465B has needed only one repair in the 25 years that I've owned it, and that was about 20 years ago. Failures, when they happen, are usually not with the CRT. Most common are capacitors going bad, similar to other electronics of the same vintage. There are some models that have some well-known problems that come up, but these are well documented. I would say that if you find one in good working condition that you will most likely get many, many years of hobbyist use out of it. Storage tubes unfortunately do wear out in the storage mode, but the most common thing is burns on the phosphor from using with the brightness turned up to max. That makes it cosmetically flawed, but it still works albiet with a dim area where the burn is. the large Classic Tek Type 549 have only 500 hours storage mode, this is true. Later models use a better technology to become a long live time of the storage mode of the CRT. Like the 564 and all later types from Tek. All of them are greatful helpers on the table, also the glowing scopes of the 500 series what I love most bec. the amazing plugin system. The storage mode is not oftenly used, only useful for very slowly operations and single shots. So this scopes have also many years of life time, I think more then a brand new DSO with its over heated smd parts. Are the transmitters and receivers for radio-control applications? Are you measuring the PWM outputs from the receiver pins, which would go to the servos? These signal pulses are often at 50 Hz. So perhaps what you're seeing makes sense. It's the width of the pulses that changes, to vary the signal going to the servos. My apologies if I misunderstood what you're doing. This just caught my eye. Join the millions of students, engineers, and technicians who have gained confidence in their measurements by using this primer. For your free digital copy, just complete this short form. Of course you have to fill in your info to be able to download it.